The dedication of St. Thomas Church at Mesaimeer on May 22, 2009 is indeed a realization of the long cherished dreams of the Syro Malabar community in Qatar. The exquisite interior of the church, the Blessed Sacrament chapel for Perpetual Adoration and the ancillary facilities including St. Alphonsa Hall, Parsonage, office rooms and catechism class rooms reminds us greatest miracle of God who built for us in His Church in this vast tract of barren deserted land. The land thankfully allocated by Government of Qatar to Inter Denominational Christian Churches (IDCC), a fellowship of Indian Christian Communities was distributed among its member churches according to the membership of each community. St. Thomas Church is built in the IDCC complex in an area of 770 Sq. Mts. The balcony within the church admeasures 365 Sq. Mts. A 50 Sq. Mts. chapel of the Blessed Sacrament is also arranged at the mezzanine floor. There is complete independence for our church in all its matters including access and administration. The altar of the church is designed following the norms in oriental Catholic traditions. The centerpiece of the Madbaha is a St. Thomas Cross weighing 16 Tons carved in a natural hard rock. The Blessed Sacrament chapel for Perpetual Adoration would remain as a sacred place of comfort, encouragement and solace for our faithful in their moments of spiritual needs. The necessity of the community for a multi-purpose hall to hold various activities is fulfilled by the St. Alphonsa Hall. The parsonage and other office rooms would offer a comfortable environment for our priests and officials. The foundation stone of the church was laid on December 9, 2005, by the late Major Archbishop Mar Varkey Cardinal Vithayathil in the presence of the Vicar Apostolic of Arabia Bishop Paul Hinder. The Church is remarkable for its thematic design and aesthetic beauty. The dedication of this church was held on May 22, 2009, by Mar Varkey Vithayathil. History will record May 22, 2009 as a monumental day of Syro Malabar Major Archiepiscopal Church. On this day, the first church our Rite in the Middle East was consecrated at Doha, the capital city of Qatar in the Arabian Gulf. 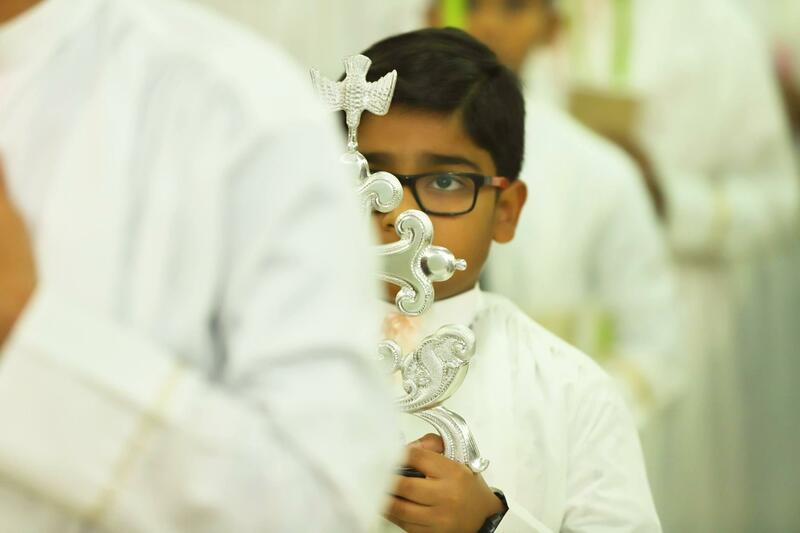 Lakhs of Syro Malabar faithful residing in the Gulf Countries rejoiced on the occasion, and today they carry an earnest belief in their heart that similar facilities for their pastoral care in their own tradition and heritage would become effective in the near future in their own places in the gulf.